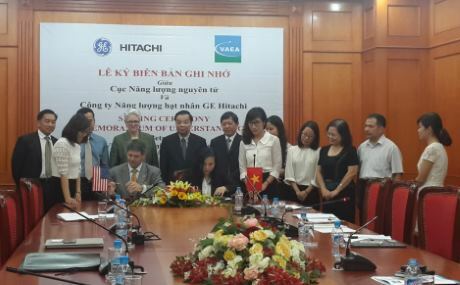 GE Hitachi (GEH) is to help the Vietnam Atomic Energy Agency (VAEA) enhance its understanding of light water reactor technology and nuclear project management under a memorandum of understanding signed in Hanoi yesterday. The agreement calls for GEH and VAEA to cooperate in promoting training and development of qualified human resources associated with Vietnam's civilian nuclear power program. GEH will provide practical work experience for VAEA staff in areas including nuclear safety culture, project management and quality assurance. It is the fourth MOU that GEH has signed in Vietnam since September 2014. Twelve students from the Hanoi University of Science and Technology and the Electric Power University have already completed internships at GEH's headquarters in Wilmington, North Carolina, under agreements signed with the two universities in September and October 2014, respectively. Earlier this year, the company also signed an agreement with the Vietnam Agency for Radiation and Nuclear Safety (VARANS) to promote human resources training and development in the field of nuclear safety analysis for boiling water reactors. The latest MOU was signed by GEH senior vice president David Sledzik and VAEA deputy director general Nguyen Thi Thu Trang. Vietnam is planning to build more than 10,000 MWe of nuclear capacity by 2030. "As Vietnam looks to low-carbon nuclear power to meet its burgeoning energy needs, we will continue to support the building of the nation's nuclear power infrastructure," Sledzik said. Work is expected to start on Vietnam's first nuclear power plant, at Phuoc Dinh in Ninh Thuan province, in 2019. Ninh Thuan units 1-4 are to be Russian-built VVER reactors, and Rosatom engineering subsidiary NIAEP signed a general framework agreement with Electricity of Vietnam for construction of the first unit in late July. A second four-unit nuclear power plant is also envisaged, also in Ninh Thuan, followed by a two-unit plant at a central location. The technology for Ninh Thuan phase 2 and the proposed central plant has not yet been decided.